Some 800,000 people attended, including representatives from Italy’s Ferretti Yachts, Rolls Royce, BMW and an American manufacturer of business jets. Chinese guests were lining up to test drive a private helicopter despite a 10,000 yuan ($1,510) flight fee. "We had lunch with officials from CCPIT (China Council for the Promotion of International Trade) after the show and they looked very highly on us. So it looks like Hainan province will be the host of next year’s event," says Yang. "We’re aiming to brand Hainan as a luxury destination for yachting, and we’re targeting the high-end domestic and international tourism market," he says. 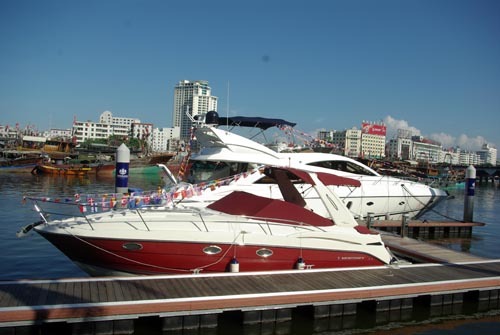 Sanya already has three yachting clubs, and 2,000 berths for them to dock. Building on the success of the boat show, several foreign manufacturers have expressed interest in setting up shop on Hainan, with Ferretti set to bring over its biggest yacht in China, a 112-footer. One of the new marinas being built by the Hainan government will be used as a stopover point for the 2011-2012 Volvo Ocean Race, which runs for nine months every three years and generates mammoth amounts of publicity for its stopover cities. According to Shen, if the Hainan government wants the island to go global, nothing can stop the steamroller in its tracks.